At French we put our customer first while partnering to meet and exceed their equipment and processing needs. See what our customers are saying about our hydraulic presses, dewatering and drying screw presses, oil extraction equipment and our aftermarket repair services. “French worked closely with us during, and after, the initial start-up of the equipment to ensure the equipment obtained our desired process results. Since the initial start-up of the Conditioner and Achiever 55 screw press we have worked together to optimize the process in terms of output, lower residual oil in the press cake and higher quality oil, which has allowed us to further decrease our overall processing costs per ton. The Achiever press has certainly proven to be the right choice for us to consistently obtain the high quality canola oil and press cake quality we require. Read more about this series of lab tests performed in our Innovation Center. “French’s engineers worked with us over several years to develop the right solution for our needs. To help create a cross-functional solution we used data collected through years of productivity studies and input from our production and maintenance personnel. French developed many iterations that were critiqued and tweaked by our teams before the final automatic hydraulic press system emerged. The automatic four-press cell design gave us a clean slate approach to our production process. Since these presses have been in operation they have greatly improved our production levels and allowed us to consistently mold high quality components.” -John Parker, Plant Engineer at Utex Industries Inc.
Read more about this automatic hydraulic press project. 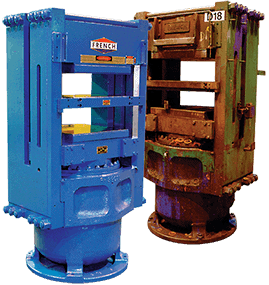 Read more about French hydraulic press rebuild services. Read more about the superior value and superior service you get from French hydraulic presses. According to Vanseal Process Engineer, Jim Pryor, the Isoplatens® are less expensive to maintain than platens heated by induction heating coils. Pryor says that the Isoplaten® “maintenance upkeep is virtually nothing,” resulting in significant money savings for the company. In twelve years of operating the Isoplatens®, Vanseal has spent roughly $500 in total platen maintenance costs for all of their Isoplaten® hydraulic presses, compared to over $1,000 a year maintaining the platens on each of their non-Isoplaten® hydraulic presses. In addition to the maintenance cost savings, Pryor says that the Isoplatens® have performed “almost flawlessly” and yield consistent part production with less scrap, giving Vanseal additional cost savings. The 32″ x 36″ Isoplatens® achieve a small temperature differential across the mold, compared to a 20 ºF temperature variation on their 24″ x 24″ presses without Isoplatens®. The 20 ºF temperature differential on the non-Isoplaten® hydraulic presses and the temperature issues including the center plate cooling off, especially on the front of press, yields more scrap than when pressing with Isoplatens®. Read more about Isoplaten® heated platen technology. French owns the exclusive license from Acrolab to sell Isobar® Super Thermal Conductors and for the manufacture and sale of Isoplatens® within the rubber molding and processing industry in North America. Isoplatens® and Isobars® are registered trademarks of Acrolab Ltd.